This volume contains the ?nal proceedings of the 2004 Metainformatics Sym- sium (MIS 2004). The event was held during 15-18 September 2004 in Salzburg, Austria at Salzburg Research. MIS is an annual event focusing on ?nding common ground shared by - searchers and practitioners in many di?erent computer science areas who may use similar methods to achieve di?erent ends. The goal is to ?nd useful abstr- tions, notations, analytical frameworks, formalisms, and systems that improve ourunderstandingoftheunderlyingstructuresofvariousdisciplinesandfamilies of systems within computer science. Ideally these constructs should have usef- ness in conveying knowledge and understanding across disciplinary boundaries. The proceedings of previous MIS events were also published by Springer in the Lecture Notes in Computer Science series: LNCS 3002 (2003), LNCS 2641 (2002), LNCS 2266 (2001), and LNCS 1903 (2000). As with previous events in the MIS series, MIS 2004 attracted quality papers and brought together researchers from many di?erent ?elds within computer s- ence.WeexperiencedinterestingpresentationsandlivelydiscussionsinSalzburg. I hope that you will ?nd the papers contained in this volume as interesting as the other members of the Program Committee and I have. This volume would not have been possible without the help and assistance of many people. In particular, I would like to acknowledge the assistance of the Springereditors,AnnaKramerandChristineGun ¨ ther,andtheExecutiveEditor of the LNCS series, Alfred Hofmann. 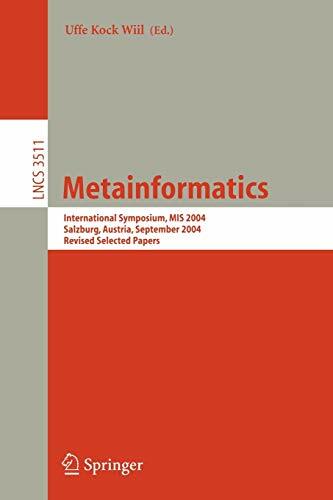 This book constitutes the thoroughly refereed post-proceedings of the Metainformatics Symposium, MIS 2004, held in Salzburg, Austria in September 2004. The 17 revised full papers presented were carefully reviewed and selected for inclusion in the book. The papers are devoted to finding useful abstractions, notations, analytical frameworks, formalisms, and systems that improve the understanding of the underlying structure of various disciplines and families of systems within computer science.